In the middle ages, there was a nunnery at Shaftesbury, and this psalter appears to have been made there or to have been modelled after a manuscript from Shaftesbury. Its calendar (used to coordinate prayers with saints' days and other feasts) and litany (a prayer appealing to saints for their help) mention saints who were especially venerated at Shaftesbury. The figures in its many pictures resemble a carving found at nearby Milborne St Andrew. Although its origins at Shaftesbury can not be shown beyond a doubt, it is certain that it was made for a female reader, probably an abbess. Recently a scholar suggested that it was made for Queen Adeliza, the widow of Henry I. Before the beginning of the psalms, the 'Shaftesbury Psalter' has a series of eight full-page pictures, arranged in pairs facing each other. 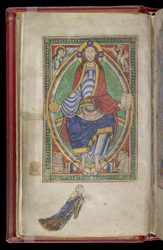 The picture of 'Christ in Majesty' has a fairly conventional depiction of Jesus appearing from heaven, enthroned upon the Heavenly Jerusalem, holding an open book and the orb of the world and surrounded by the four animals which appear in scripture (Revelations 4, 5) and Christian theologians viewed as signs of the four evangelists or gospels (man = Matthew, lion = Mark, ox = Luke, eagle = John). An abbess bows in adoration before the vision.